Pretoria High Pressure Cleaning Services. Get 4 Quotations With One Call! In Need Of High-Pressure Cleaning In Pretoria? Contact us for roofs, walls & paving cleaning prices. We’re The #1 High Pressure Cleaners In Gauteng. High-Pressure Cleaning – Pretoria: There isn’t any doubt that beautiful and clean driveways boost the curb appeal of any property. However, it’s not always fun or enjoyable cleaning a driveway. In fact, it can be difficult, tiring and inconvenient getting rid of tough dirt and grime, not to mention grease and oil spots, which gathered over time. Thankfully, with high-pressure cleaning technology, this hassle just vastly improved. Driveways’ appearance can be vastly improved using high-pressure cleaning technology. However, it’s not necessarily recommended that you try and take on this job on your own. There are many reasons for this, but perhaps one of the most important reasons would be the fact that you probably can’t rival a professional cleaner’s experience and expertise. Whereas you may want to clean your driveway once every six months, these professionals work on driveways daily. 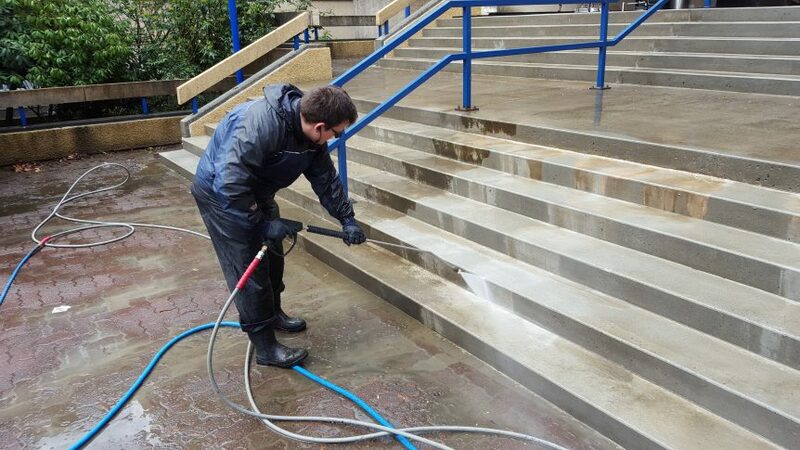 They are up to date and experienced in using the very latest and most cutting-edge high-pressure cleaning technologies available on the market. Aside from this, they also know exactly how to use it so that they can maximise the use and return on investment. So even if you were to rent a high-pressure cleaning machine and try and use it on your own, chances are you won’t be as useful as an experienced and seasoned professional in getting it to work to its full potential. What Are Some of the Great Benefits of Using High-Pressure Cleaning on Your Driveway? Perhaps one of the biggest benefits of opting for high-pressure cleaning solutions is the fact that it saves you time. Whereas you would have to spend hours and hours manually cleaning stains off your driveway, high-pressure cleaning can easily and quickly get rid of stains, oil and other grime with ease. There isn’t any need for you to spend a lot of time and money on trying to restore the appeal and cleanliness of your driveway with this technology at hand, which brings us to our next benefit. High-pressure cleaning saves you money. Whereas you’d have to treat your driveway with numerous treatments to achieve the same outcome you would receive using high-pressure cleaning, you now only have one process to invest in. This saves you a lot of resources such as to buy an industrial high pressure cleaning machine, you can use on other areas of your home’s upkeep and maintenance, and you can look forward to keeping your property in an excellent condition throughout the year. High-pressure cleaning isn’t only suited for use on driveways. Its use can extend to cleaning exteriors, and help boost the general appearance of your home. Clean exteriors add instant charm and enhance the visual appeal of any home. It’s just as effective as a fresh paint job to shave years off your property. So, clean your roof, walls and other areas of your home using effective high-pressure cleaning technology, and let the professionals help you harness the power of this incredible technology in and around your property. How much does it cost to have a roof cleaned? Contact Painters Pretoria to get a quote! Complete the form and get quotes from up to 3 painting companies near you.